The apartments Dimosthenis, which can be found at Perigiali village, were built with excellent taste and respect to the natural and quiete environment with a wonderful view of Madouri and Scorpios island. Perigiali can be found 1 klm of Nidri, the most cosmopolitan area of Lefkada island. It is a small settlement built on a picturesque landscape combining mountain and sea, which enchants visitors from the first moment. New building apartment, are decorated in style and designed paying particular attention to detail. They are at the beautiful Perigiali,20m from the main street, 50 metre from the sea, 800m away from Nidri and 15 minutes far away from Lefkas town. Also the distance from the airport of Aktio is 30 minutes. 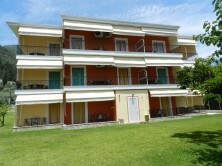 Consist of studios and apartments with 2 or 3 rooms with kitchen and bathroom. Each studio is 30 square meters and each apartment is 40 square meters. All have TV, A/C and balcony.They have sea view and mountain view. The apartments are surrounded by luxuriant vegetation and there is also a parking. Good evening, my name is Gjorgji and two years ago we went guests at your place and liked it a lot. Thats why we’re interested to come again and i would like to know the price for the big apartment for 4 or 5 persons and if there is a discount for early booking?